Does This Not Outrage You? Much has been said over the past two days in the world press about a sick video showing an FSA commander tearing the heart out of a dead Hezbullah fighter (sent to murder Syrians) in Qusayr, Homs and then eating it. The video is vile. The act is vicious. The cannibalism is inexcusable. However, the ‘outrage’ over this video has been proclaimed by Human Rights Watch to be “the most disgusting atrocity filmed in the Syrian Civil War”. Human Rights Watch is also quoted in dozens of the world’s most widely read newspapers, television programs and news media networks stating the same. The media in general has taken the same attitude, saying that this single video, is the worst thing to have befallen the Syrian Revolution (they incorrectly call it a civil war). Honestly? This video is the worst you people have seen come out of Syria? If that’s the case, then allow me to educate you for a moment. Countless keyboard pontificators, armchair generals, faux-leftists and of course, Assad’s supporters have pounced on this video, waved it like a flag in the wind, and declared that every Syrian who is not on Assad’s side of the massacre (again, not civil war) is a ‘dirty cannibal terrorist’. And yes, they apply that label to babies, children, women, the elderly and the 90,000+ martyrs that Assad’s forces have killed since March 2011. Where was your outrage, dear fellow humans, when all of the videos below were released? I categorized (that’s how many there are now) them for you below. Can you watch them? Can you bear it? Can you stand it? Or will you look away? Toss our martyrs aside and forget us, or even worse, tell us that our 90,000 dead are all the result of ‘terrorists’ and/or the most elaborate ‘hoax’ of all time. Which is what the Assad regime has said since the first protesters took to the streets in Daraa on March 15th, 2011. The videos below represent a tiny fraction of the entire body of videos released from Syria and represent a much smaller fraction of what actually happens across the country that is not recorded. I can say, with full, and disgusting, confidence that the Syrian Revolution, turned massacre, is the largest ever mass murder of the Information Age, where there is literally hundreds upon hundreds of thousands of videos to attest to that fact, many of them recorded and released in near real-time. You can continue your outrage over the video of a cannibal ripping the heart out of a terrorist sent to fight on behalf of a sectarian warlord with the sole aim of empowering a dictator so that he may resume his reign of terror on the people of my country. However, you have no right to label it the ‘most disgusting atrocity’. No right whatsoever. *These videos are by no means all or even the worst to have emerged from Syria. They are a sample that I have been able to find in the last 2 hours. LEAKED VIDEOS OF ASSAD’S FORCES TORTURING AND EXECUTING CIVILIANS AND FSA: It is worth it to note that of the few videos posted below, Assad’s regime has not even gone as far as to acknowledge their very existence (of the videos), much less hold those in the videos accountable (since the regime is the one ordering such atrocities). It is also worthy to note that most major crimes by the FSA have been acknowledged and admitted. Even though the FSA is not a formal organization, nor does it have any type of structure or tangible line of command. The FSA even published a statement about the cannibal video here. Something Assad never has, or ever will do. BEIRUT, Lebanon — After dragging 46 bodies from the streets near his hometown on the Syrian coast, Omar lost count. For four days, he said, he could not eat, remembering the burned body of a baby just a few months old; a fetus ripped from a woman’s belly; a friend lying dead, his dog still standing guard. An image from Bayda, Syria, released by a group, the Syrian Revolution Against Bashar Assad. Syrians have been shocked by video from coastal towns. Omar survived what residents, antigovernment activists and human rights monitors are calling one of the darkest recent episodes in the Syrian war, a massacre in government-held Tartus Province that has inflamed sectarian divisions, revealed new depths of depravity and made the prospect of stitching the country back together appear increasingly difficult. That mass killing this month was one in a series of recent sectarian-tinged attacks that Syrians on both sides have seized on to demonize each other. Government and rebel fighters have filmed themselves committing atrocities for the world to see. Footage routinely shows pro-government fighters beating, killing and mutilating Sunni rebel detainees, forcing them to refer to President Bashar al-Assad as God. One rebel commander recently filmed himself cutting out an organ of a dead pro-government fighter, biting it and promising the same fate to Alawites, members of Mr. Assad’s Shiite Muslim sect. That lurid violence has fueled pessimism about international efforts to end the fighting. As the United States and Russia work to organize peace talks next month between Mr. Assad and his opponents, the ever more extreme carnage makes reconciliation seem more remote. The recent executions, reconstructed by speaking with residents and human rights monitors, unfolded over three days in two Sunni enclaves in the largely Alawite and Christian province, first in the village of Bayda and then in the Ras al-Nabeh district of the nearby city of Baniyas. “How can we reach a point of national forgiveness?” said Ahmad Abu al-Khair, a well-known blogger from Bayda. He said that the attacks had begun there, and that 800 of about 6,000 residents were missing. 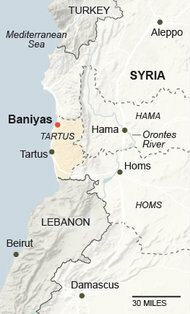 Images of the killings in and around Baniyas have transfixed Syrians. In one video that residents say shows victims in Ras al-Nabeh, the bodies of at least seven children and several adults lie tangled and bloody on a rain-soaked street. A baby girl, naked from the waist down, stares skyward, tiny hands balled into fists. Her round face is unblemished, but her belly is darkened and her legs and feet are charred into black cinders. Opposition leaders called the Baniyas killings sectarian “cleansing” aimed at pushing Sunnis out of territory that may form part of an Alawite rump state if Syria ultimately fractures. Mr. Houry said the killings inevitably raised such fears, though there was no evidence of such a broad policy. Tens of thousands of displaced Sunnis are staying in the province, largely safe. When the uprising began in March 2011 as a peaceful movement, Sunnis in Bayda raised banners denouncing Sunni extremists, seeking to reassure Alawites that they opposed Mr. Assad, not his sect, said Mr. Abu al-Khair, the blogger. In May 2011, security forces stormed the village, killing demonstrators, including women. After that, Bayda remained largely quiet. Most activists and would-be fighters left. But residents said they often helped defecting soldiers escape, a pattern they believe set off the violence. Activists said that on May 2, around 4 a.m., security forces came to detain defectors, and were ambushed in a fight that killed several government fighters — the first known armed clash in Baniyas. The government called in reinforcements and, by 7 a.m., began shelling the village. A pro-government television channel showed a reporter on a hill above Bayda. Smoke rose from green slopes and houses below, where, the reporter said, “terrorists” were hiding. A group of men the reporter described as government fighters walked unhurriedly through a square. “God willing, Bayda will be finished today,” a uniformed man said on camera. What happened next was described in Skype interviews with four survivors who for their safety gave only nicknames, an activist in Baniyas, and Mr. Abu al-Khair, who said he had spoken from Damascus with more than 30 witnesses. Men in partial or full military dress went door to door, separating men — and boys 10 and older — from women and younger children. Residents said some gunmen were from the National Defense Forces, the new framework for pro-government militias, mainly Alawites in the Baniyas area. They bludgeoned and shot men, shot or stabbed families to death and burned houses and bodies. The activist in Baniyas, Abu Obada, said security forces had told people to gather in the square, and some Bayda villagers, fearing a massacre, attacked them with weapons abandoned by defectors. Other residents disputed that or were unsure because they had been hiding. A cousin of Mr. Abu al-Khair’s, who gave her name as Warda al-Hurra, or the Free Rose, said her female relatives had described being herded to a bedroom with children, and heard male relatives crying out in pain nearby. At one point, her cousin Ahmed, 10, and brother Othman, 16, were brought in, injured and “limp as a towel,” she said. Soon another gunman shouted at him and took the boys away. They are still missing. The man relented. The women heard gunmen celebrating in the square; later they were released. When they ventured out, there were “bodies on every corner,” Ms. Hurra said. Another resident, Abu Abdullah, said he had fled his house and returned after dark to find stabbed, charred bodies of women and children dumped in the square, and 30 of his relatives dead. Omar, of nearby Ras al-Nabeh, the man who had dragged dozens of bodies from the streets, said he had helped Bayda residents pick up bodies, placing 46 in two houses and the rest in a mosque, then had run away, fearing the return of the killers. He said he had recognized some bodies, including the village sheik, Omar al-Bayassi, whom some considered pro-government. One video said to be from Bayda showed eight dead children on a bed. Two toddlers cuddled face to face; a baby rested on a dead woman’s shoulder. On May 4, shelling and gunfire began to hit Ras al-Nabeh. Abu Yehya, a resident, hid in his house with his wife and two children, who stayed quiet: “Their instincts took over.” Two days later, he said, he emerged to find his neighbors, a family of 13, shot dead against a wall. On May 6, security forces allowed in Red Crescent workers. Bodies were tossed and bulldozed into trucks and dumped in a mass grave, Mr. Abu al-Khair said. Residents posted smiling pictures of children they said had been killed: Moaz al-Biassi, 1 year old, and his sister Afnan, 3. Three sisters, Halima, Sara, and Aisha. Curly-haired Noor, and Fatima, too little to have much hair but already sporting earrings. Displaced Sunnis who had sheltered there are fleeing, and some say Alawites are no longer welcome. “It’s now impossible for them to stay in Syria,” Omar said. Hwaida Saad contributed reporting from Beirut, and Sebnem Arsu from Antakya, Turkey.